In 1929, she accepted a job with the new Fortune magazine as an associate editor. She was talented, took risks and was becoming more successful than some of her male colleagues. Beginning in 1930, she was sent to the Soviet Union on assignment, becoming the first Western photographer allowed into that country. In 1931, she published Eyes on Russia. In the mid-thirties, she photographed drought victims of the Dust Bowl. In 1935, she joined the newly created Life magazine. Bourke-White's photograph of the Fort Peck Dam appeared on Life's first cover. She then traveled the American South with a writer, Erskine Caldwell, to document living conditions of poor tenant farmers. In 1937, they published a book You Have Seen Their Faces. That same year, one of her most famous photographs was published in Life. It featured black victims of a flood in Louisville, Kentucky standing in a breadline beneath a billboard of smiling white family in a car. The headline on the billboard read: "World's Highest Standard of Living- There's no way like the American Way." Bourke-White married Caldwell in 1939 and together they published two more books. North of the Danube (1939) chronicled life in Czechoslovakia before the Nazi invasion and Say, Is This the U.S.A. (1941) was about life in the U.S.A. just before entering World War II. They were both in Moscow when the Germans attacked that city and Bourke-White sent a series of spectacular photos of the event to Life magazine. She was the only foreign photographer in the Soviet Union at the time. Bourke-White and Caldwell divorced in 1942, and she went on to photograph action in North Africa and in Italy. 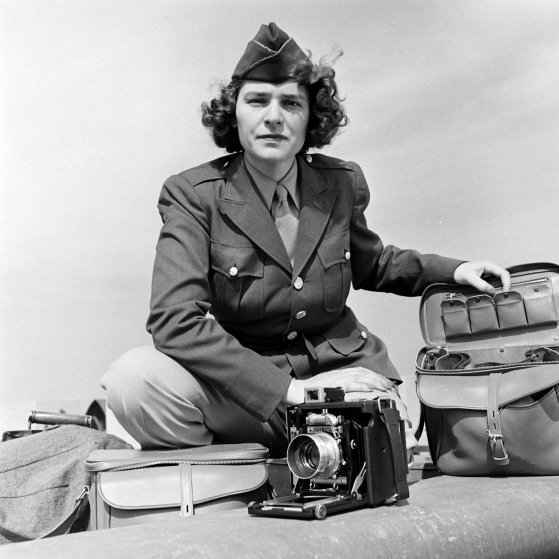 She was the first woman accredited by the U.S. Army as a war correspondent and crossed the German border with Patton's troops. She was also one of the first photographers to enter and document death camps. Her photos were so compelling that Life published them, breaking the tradition of avoiding the horrific aspects of the war. The Living Dead of Buchenwald became a classic. After the war, she was sent to India, where she took one of her most famous photographs, Gandhi at His Spinning Wheel. From 1949 to 1953, she photographed life in South Africa under apartheid, as well as the Korean War. In the mid-1950's, Burke-White discovered she had Parkinson's disease and gradually withdrew from professional photography. In 1963, she published an autobiography, Portrait of Myself. Many of her photographs may be found in museum collections. 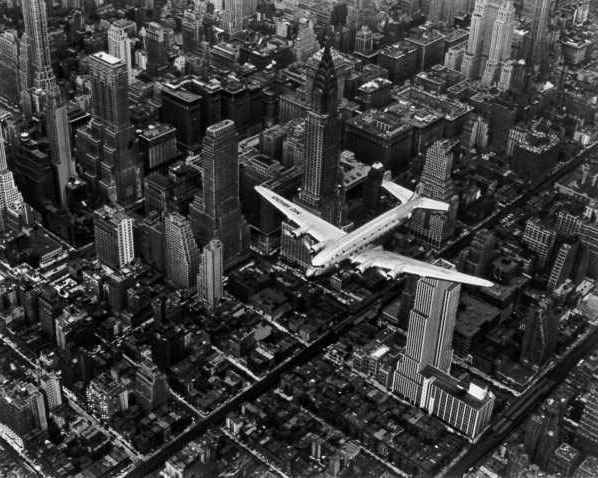 Margaret Bourke-White died in Connecticut in 1971. 20" x 24" Framed: 20" x 24"